TITAN 4 Manipulator Systems from Schilling Robotics, LLC. Hundreds of TITAN 4 manipulator systems are in use worldwide every day. TITAN manipulators are the highest quality system on the market for the dexterity and strength needed to withstand the industry's harsh and repetitive needs day after day. 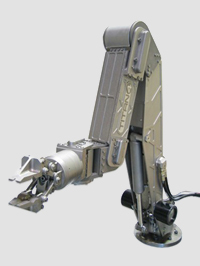 The TITAN 4 manipulator's accuracy is limited only by the pilot's eye. The TITAN 4's master controller includes a six-degree-of-freedom replica master arm that ensures comfortable, intuitive manipulator operation. The TITAN 4's movements are just as sharp when it's moving a 5 lb. object as when it is moving a 250 lb. object.